In 1862, following a plea from King Kamehameha IV and Queen Emma to the Church of England, the first Anglican (Episcopalian) bishop and priests arrived to establish the Diocese of Honolulu. In addition to Kamehameha IV and Queen Emma initiating the Cathedral of St. Andrew, they also founded two schools; ʻIolani School, which began as St. Alban’s School for boys. Later, St. Andrew’s Priory for girls was founded. ʻIolani is now coeducational, while the Priory remains a school for girls. 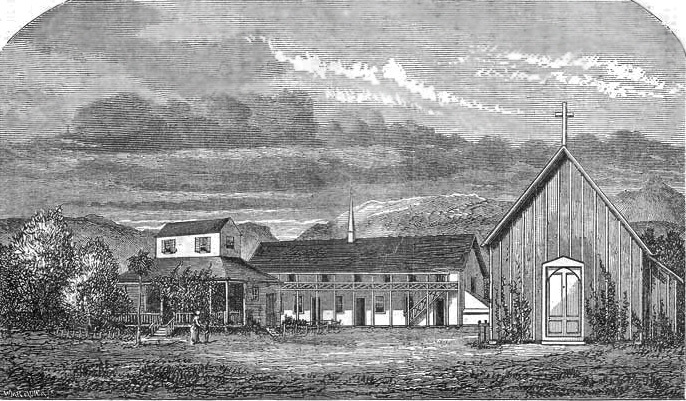 By 1863, Father William R. Scott had secured property and begun Luaʻehu School in Lāhainā, Maui (on the site where King Kamehameha III School now stands.) This was the beginning of the present ʻIolani School. When Father Scott returned to England, Father George Mason came to relieve him. In 1870, when Bishop Staley left Honolulu, Father Mason was called back to the capital city. It was at this time that the school was transferred to Honolulu. In the same year, Queen Emma bestowed on the school the name “ʻIolani,” or Heavenly Hawk. In Honolulu, it started at the Cathedral Church of Saint Andrew; but as the pupils increased in numbers, it was found necessary to remove to more spacious and better adapted premises a mile out of Honolulu. In September 1927, ‘Iolani School opened on a five-acre Nu‘uanu campus where 278 boys, including 32 boarders, were enrolled. The athletic field bordered Nu‘uanu Stream and, while 400 feet long, was still not wide enough for official football games. Some of the buildings were Staley Hall, Iaukea Hall and Willis Hall. But, foreseeing that ‘Iolani would eventually outgrow this location, the school purchased a parcel on the Ala Wai Canal, in 1938. World War II intervened before construction could begin on the new campus. On November 12, 1946, ‘Iolani began classes for the first through sixth grades at the Ala Wai campus in buildings erected by the Army. Seventh through twelfth grade classes continued at the Nu'uanu campus. Then, in 1953, ‘Iolani had completely relocated to the 25-acre Ala Wai site. In 1979, after 115 years as a boys school, ‘Iolani went co-educational, when 87 pioneering girls enrolled in the school. Over the decades, buildings were added, enrollment enlarged and ‘Iolani School has grown to be one of Hawai‘i’s leading educational institutions. Overall class size varies depending on grade. There are approximately 70 students per grade in kindergarten through 5th grade and 120 students in 6th grade. Overall, there are 540 students in the Lower School. Kindergarten classes have a pupil-teacher ratio of 12:1. Grades 4 - 6 are departmentalized and students report to different teachers for their classes. Lower School students also receive specialized instruction from PE, dance, music, art, computer, science and religion teachers. The goal for the Upper School is 1,315 students, with 180 students in 7th grade, 195 in 8th, 240 in 9th and 230 - 235 in 10th - 12th. The average class size is 17; the student-teacher ratio throughout the school is 8:1. The Lower School is situated at the Diamond Head end of the 25-acre campus and encompasses the primary (K-3) and elementary (4-6) grades. The Upper School includes grades 7 - 12 and is located on the Ewa side of campus. All students share the use of the pool, gyms and fields. The lower and upper schools have separate library, dance and computer facilities. 'Iolani retains its Episcopal tradition; all students are required to attend weekly Chapel services. Students also attend religion classes to gain insight into other faiths and cultures. 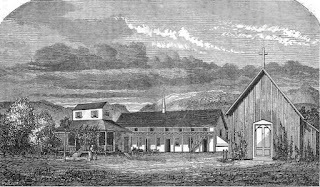 The image shows St. Alban’s College in Honolulu (1866,) a forerunner to the present-day ‘Iolani School. In addition, I have added other images of ‘Iolani School in a folder of like name in the Photos section on my Facebook page.